Intriguing 14k White gold Tanzanite and Diamond ring. Tanzanite center is a square cushion cut gem 1.14ct. Baguette diamond accents total .20ctw. Truly beautiful Tanzanite diamond ring. Lovely 14k White gold Trillion Tanzanite and diamond Ring. 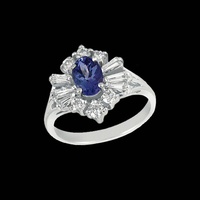 14k White holds a 5mm trillion shape Tanzanite in this pretty ring. Diamond accents total 1/4 ct and surround the center then spill to the shank. A great ring for everyday wear. We're happy to custom size this ring but keep in mind custom sized items are non-returnable. Magnificent 14k white gold swirl ring design set with a brilliant 6mm round genuine Tanzanite and 1/5ct tw diamonds around the center stone and part way down the shank. Stock Size; 7. We are happy to size this ring up or down 1 size free of charge. Custom sized items are non-returnable. Breathtaking 18k White gold pear shape Tanzanite and diamond ring. Pear shape Tanzanite measures 8x6mm and is .95ct. Tanzanite is surrounded with baguette and round diamonds totaling .63ct tw. A gorgeous ring. We're happy to size this ring but size items are custom and non returnable. Harmonious 14k White gold Tanzanite and diamond ring. 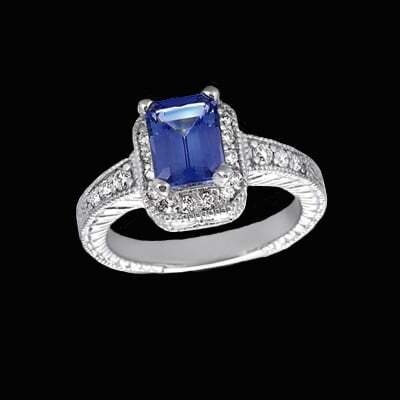 This great ring features an emerald cut Tanzanite that measures 7x5mm weighing .97ctw. Milgrain borders add a nice accent to this ring. There are 16 baguette and round diamond that total .48ct tw. We're happy to size this ring but size items are custom and non returnable. Splendid 14k White gold Tanzanite and diamond ring. Magnificant Tanzanite is 1.46ct and measures 8x6mm oval. Diamonds surround the gem and are a perfect compliment either side. Baguette and round diamonds total 3/4ctw. An incredible ring. We're happy to size this ring but size items are custom and non returnable. Unique Tanzanite Ring. 14k White gold pear shape Tanzanite approx.. 1.05 ct clean AAA color stone surrounded with .95ct tw SI 1 clarity G color diamonds. Very pretty ring. Made to order, also available in yellow gold, 18kt gold, or Platinum. 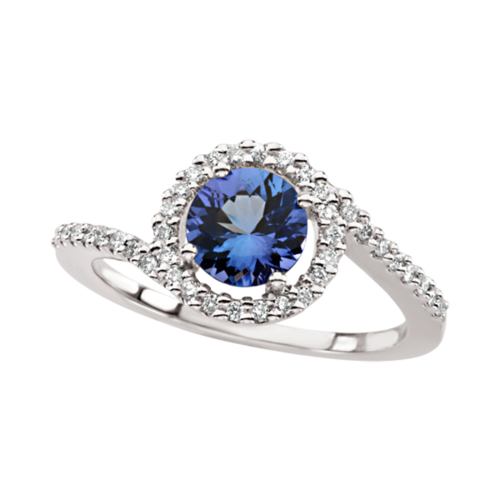 Fall in love with our Romantic Tanzanite and Diamond ring. 18k White gold set with an oval Tanzanite weighing .85ctw. Tanzanite measures 7x5mm and is accented with baguette and round diamonds totaling .39ctw. This luxurious ring would make any princess happy. We're happy to size this ring but size items are custom and non returnable. Stylish 14k White gold Tanzanite and diamond ring. Magical trillion cut Tanzanite is at this rings center and measures 6mm, weighs .81ct. Channel set accent diamonds total .23ct tw. 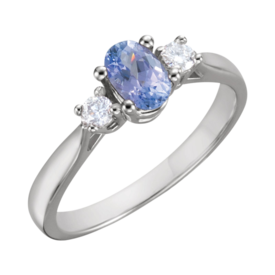 A pretty Tanzanite ring at a great price. We're happy to size this ring but size items are custom and non returnable. Polished style 14k White gold emerald cut Tanzanite and diamond ring. Lovely emerald Tanzanite measures 8x6mm, 1.40ctw. Vibrant diamonds are round and total .59ctw. A finely crafted, gorgeous ring. We're happy to size this ring but size items are custom and non returnable. Great price on this 14k white gold Tanzanite and diamond swirl design ring. Diamonds set either side of the Tanzanite center in this charming ring and total .11ct tw. Center genuine Tanzanite measures 5mm round and weighs about .53ctw. You'll love this ring and want to wear it everyday. We're happy to size this ring but size items are custom and non returnable. Flashy 18k White gold Tanzanite and diamond ring. Indulge yourself with this diamond encrusted Tanzanite ring. Center tanzanite is an oval gem that measures 6x5mm .83ct. Diamonds in a curved partially split design total .68ct tw in this incredible ring. We're happy to size this ring but size items are custom and non returnable. Vibrant 14k yellow gold Tanzanite and diamond ring. Center genuine Tanzanite is lovely trillion cut 7mm 1.17ct gem and is half bezel v-prong set in this exciting ring design. Diamonds and channel set either side and 8 of them total .29ct tw. We're happy to size this ring but size items are custom and non returnable. Stunning Emerald cut Tanzanite and diamond ring. 14k White gold holds this Emerald cut 8x6mm genuine that weighs 1.46ct. The beautiful Tanzanite is surrounded with .31ct tw diamonds in a gentle cross over design. The diamonds are a micro-pave set round stones. Center Tanzanite is prong set. Treat yourself or someone special to this incredible ring. We're happy to size this ring but size items are custom and non returnable. Dazzling 14k white gold twin trillion Tanzanite and diamond ring. Center genuine oval Tanzanite is prong set and .95ct stone. Accent Diamonds on either side total .18 ct tw and are SI 1 clarity. You'll fall in love with this naturally beautiful fun design ring. We're happy to size this ring but size items are custom and non returnable. Beautiful 14k white gold Tanzanite and diamond ring. Center genuine oval Tanzanite is prong set and .95ct stone. Accent Diamonds on either side total .18 ct tw and are SI 1 clarity. We're happy to size this ring but size items are custom and non returnable. Spectacular 18k White gold Tanzanite and diamond ring. This unbelievable ring is set with a 16 x 12mm oval Tanzanite gem that weighs 10.86ct. Truly magnificant. Princess and round diamond provide a dazzling frame and total 1.02ct tw. This finely crafted in luxurious 18k gold Tanzanite ring is a true delight for the eyes. You'll feel like royalty with this magical ring. We're happy to custom size this ring - customized items are non returnable. 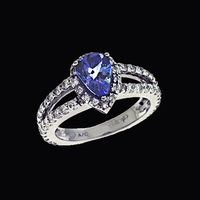 Classic design 14k white gold genuine Tanzanite and diamond 3 stone ring. Center Tanzanite measures 6x4mm oval and is flanked either side with a 2.7mm round diamond. Stock Size; 6. We are happy to size this ring up or down 1 size free of charge. Custom sized items are non-returnable. Gorgeous 14k White gold Diamond and Tanzanite ring. Genuine Tanzanite is AAA color and clean clarity, oval gem totals .90ctw. Round diamonds are SI 1 clarity G in color and diamond baguettes are an incredible VS2 clarity G color. Diamonds total .67ct tw in this ring. You will love the cool crisp style and superior quality. Gorgeous Emerald Cut genuine Tanzanite takes center stage in this 14k White gold ring and is surrounded by diamonds. Genuine Tanzainte is AAA color with Clean clarity and totals 1.75ctw. Surrounding diamonds are SI 1 clarity G color and add .37ctw to the ring. Ring available in 14k White or Yellow, Platinum, and 18KT gold.